дома » ARMENIAN - ENGLISH CONVERSATION GUIDE հայերեն անգլերեն զրուցարան » ՀԱՅԵՐԵՆ — ԱՆԳԼԵՐԵՆ ԶՐՈՒՑԱՐԱՆ: ԵՐՐՈՐԴ ՄԱՍ: ՎՃԱՐՈՒՄ, ԴՐԱՄ: PAYMENT, MONEY. 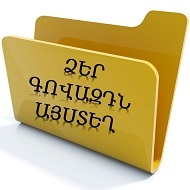 Ներբեռնել լավ որակով ( PDF) ՎՃԱՐՈՒՄ, ԴՐԱՄ: PAYMENT, MONEY. փէյմընթ, մանի: (էջ 154-159). կատարվեն կանխիկ: What point shall we discuss now? them next week at the latest. will be opened next week. Previous post: ՀԱՅԵՐԵՆ — ԱՆԳԼԵՐԵՆ ԶՐՈՒՑԱՐԱՆ: ԵՐՐՈՐԴ ՄԱՍ: ԳՆԵՐ: PRICES. Next post: ՀԱՅԵՐԵՆ — ԱՆԳԼԵՐԵՆ ԶՐՈՒՑԱՐԱՆ: ԵՐՐՈՐԴ ՄԱՍ: ՏԵՍՉԱԿԱՆ ՍՏՈՒԳՈՒՄ ԵՎ ՓՈՐՁԱՐԿՈՒՄ: INSPECTIONT and TEST.